Children and older people from across South Cumbria have been able to work together in Ford Park, Ulverston to create a wildflower meadow. The inter-generational project has been supported by a £1,400 grant from Cumbria Community Foundation’s HSBC Fund. The money enabled Ford Park Community Group to purchase equipment needed to start the wildflower meadow project as well as attract further funding for the group. Alison Alger, Chief Executive Officer of Ford Park Community Group said: “The project has had an impact on all the children and parents involved as well as the older people working in inter-generational groups. 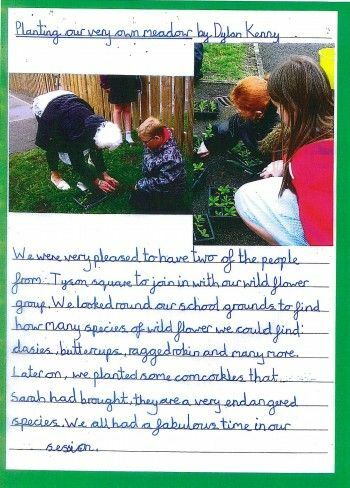 “It has increased their awarness of the plants they grow and the children appreciate the knowledge and experience of the older people. To find out more about the HSBC Fund and other funds available at Cumbria Community Foundation please visit the grants page or contact our Grants Officers by email or on 01900 825760.